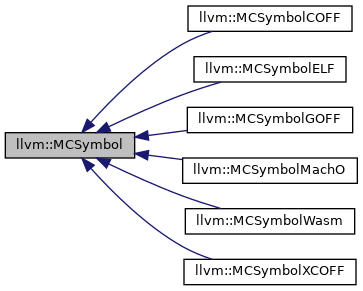 MCSymbol - Instances of this class represent a symbol name in the MC file, and MCSymbols are created and uniqued by the MCContext class. MCSymbols should only be constructed with valid names for the object file. If the symbol is defined/emitted into the current translation unit, the Section member is set to indicate what section it lives in. Otherwise, if it is a reference to an external entity, it has a null section. Definition at line 41 of file MCSymbol.h. The name for a symbol. MCSymbol contains a uint64_t so is probably aligned to 8. On a 32-bit system, the name is a pointer so isn't going to satisfy the 8 byte alignment of uint64_t. Account for that here. Definition at line 148 of file MCSymbol.h. The alignment of the symbol, if it is 'common', or -1. The alignment is stored as log2(align) + 1. This allows all values from 0 to 2^31 to be stored which is every power of 2 representable by an unsigned. Definition at line 117 of file MCSymbol.h. The Flags field is used by object file implementations to store additional per symbol information which is not easily classified. Definition at line 122 of file MCSymbol.h. A symbol can contain an Offset, or Value, or be Common, but never more than one of these. Definition at line 55 of file MCSymbol.h. The kind of the symbol. If it is any value other than unset then this class is actually one of the appropriate subclasses of MCSymbol. Definition at line 45 of file MCSymbol.h. Definition at line 152 of file MCSymbol.h. References assert(), F(), getFragment(), llvm::PointerIntPair< PointerTy, IntBits, IntType, PtrTraits, Info >::getInt(), llvm_unreachable, Name, Offset, operator=(), and llvm::PointerIntPair< PointerTy, IntBits, IntType, PtrTraits, Info >::setInt(). Declare this symbol as being 'common'. Size - The size of the symbol. Align - The alignment of the symbol. Definition at line 368 of file MCSymbol.h. References assert(), CommonSize, getCommonAlignment(), getOffset(), isCommon(), and setCommon(). dump - Print the value to stderr. Definition at line 85 of file MCSymbol.cpp. Return the alignment of a 'common' symbol. Definition at line 358 of file MCSymbol.h. References assert(), CommonAlignLog2, and isCommon(). Referenced by declareCommon(), and llvm::MCSymbolMachO::getEncodedFlags(). Return the size of a 'common' symbol. Definition at line 335 of file MCSymbol.h. References assert(), CommonSize, and isCommon(). Referenced by getSymbolValue(), and llvm::MachObjectWriter::writeNlist(). Get the (implementation defined) symbol flags. Definition at line 406 of file MCSymbol.h. Referenced by llvm::MCSymbolCOFF::getClass(), llvm::MCSymbolMachO::getEncodedFlags(), llvm::MCSymbolMachO::isAltEntry(), llvm::MCSymbolELF::isBindingSet(), llvm::MCSymbolMachO::isCold(), llvm::MCSymbolWasm::isExported(), llvm::MCSymbolMachO::isNoDeadStrip(), llvm::MCSymbolCOFF::isSafeSEH(), llvm::MCSymbolELF::isSignature(), llvm::MCSymbolMachO::isSymbolResolver(), llvm::MCSymbolMachO::isWeakDefinition(), llvm::MCSymbolCOFF::isWeakExternal(), llvm::MCSymbolMachO::isWeakReference(), llvm::MCSymbolELF::isWeakrefUsedInReloc(), llvm::MCSymbolELF::setBinding(), llvm::MCSymbolELF::setIsSignature(), llvm::MCSymbolELF::setIsWeakrefUsedInReloc(), llvm::MCSymbolELF::setOther(), llvm::MCSymbolELF::setType(), and llvm::MCSymbolELF::setVisibility(). Definition at line 383 of file MCSymbol.h. References llvm::MCExpr::findAssociatedFragment(), llvm::PointerIntPair< PointerTy, IntBits, IntType, PtrTraits, Info >::getPointer(), getVariableValue(), isVariable(), and llvm::PointerIntPair< PointerTy, IntBits, IntType, PtrTraits, Info >::setPointer(). Referenced by absoluteSymbolDiff(), canUseLocalRelocation(), llvm::MCStreamer::EmitLabel(), encodeBase64StringEntry(), llvm::MCExpr::findAssociatedFragment(), getARMFixupKindMachOInfo(), llvm::MCAssembler::getAtom(), getFixupKindLog2Size(), getFixupOffset(), getLabelOffset(), llvm::RISCVMCExpr::getPCRelHiFixup(), llvm::MachObjectWriter::getSymbolAddress(), getSymbolValue(), isAbsolute(), llvm::MCObjectWriter::isSymbolRefDifferenceFullyResolved(), llvm::MCObjectWriter::isSymbolRefDifferenceFullyResolvedImpl(), llvm::MachObjectWriter::isSymbolRefDifferenceFullyResolvedImpl(), isUndefined(), and MCSymbol(). Get the (implementation defined) index. Definition at line 309 of file MCSymbol.h. Referenced by isAssociative(), and isWeak(). getName - Get the symbol name. Definition at line 202 of file MCSymbol.h. References llvm::PointerIntPair< PointerTy, IntBits, IntType, PtrTraits, Info >::getInt(). Referenced by llvm::MachObjectWriter::bindIndirectSymbols(), canGoAfterDWARF(), canUseLocalRelocation(), createPPCMCAsmInfo(), llvm::RecordStreamer::EmitCommonSymbol(), llvm::MipsTargetAsmStreamer::emitDirectiveCpsetup(), llvm::MipsTargetAsmStreamer::emitDirectiveEnt(), emitDirectiveRelocJalr(), llvm::WebAssemblyTargetAsmStreamer::emitEventType(), llvm::EHStreamer::emitExceptionTable(), llvm::MipsAsmPrinter::EmitFunctionBodyEnd(), llvm::X86AsmPrinter::EmitFunctionBodyEnd(), llvm::AsmPrinter::EmitFunctionEntryLabel(), llvm::WebAssemblyTargetAsmStreamer::emitFunctionType(), llvm::WebAssemblyTargetAsmStreamer::emitGlobalType(), llvm::AsmPrinter::EmitGlobalVariable(), llvm::MCELFStreamer::EmitIdent(), llvm::WebAssemblyTargetAsmStreamer::emitImportModule(), EmitNops(), llvm::TargetLoweringObjectFileELF::emitPersonalityValue(), encodeBase64StringEntry(), EvaluateCRExpr(), llvm::RecordStreamer::flushSymverDirectives(), GetAEABIUnwindPersonalityName(), getARMFixupKindMachOInfo(), llvm::MCContext::getAssociativeCOFFSection(), llvm::MCAsmLayout::getBaseSymbol(), llvm::TargetLoweringObjectFileELF::getCFIPersonalitySymbol(), getCIEVersion(), llvm::MCContext::getCOFFSection(), llvm::MCContext::getELFSection(), llvm::MCSymbolMachO::getEncodedFlags(), llvm::TargetLoweringObjectFileCOFF::getExplicitSectionGlobal(), getFixupKindLog2Size(), getFixupOffset(), llvm::MCSymbolWasm::getImportName(), llvm::TargetLoweringObjectFileMachO::getIndirectSymViaGOTPCRel(), getLabelOffset(), llvm::TargetLoweringObjectFileCOFF::getSectionForJumpTable(), getStaticStructorSection(), llvm::MachObjectWriter::getSymbolAddress(), getSymbolOffsetImpl(), getSymbolValue(), llvm::MCContext::getWasmSection(), hasGOTReference(), llvm::HexagonMCELFStreamer::HexagonMCEmitCommonSymbol(), isAssociative(), isInSymtab(), isWeak(), llvm::MCGenDwarfLabelEntry::Make(), llvm::MCExpr::print(), llvm::X86Operand::print(), print(), printFPOReg(), llvm::MipsAsmPrinter::printOperand(), llvm::NVPTXInstPrinter::printProtoIdent(), printSImmOperand(), llvm::MCSectionELF::PrintSwitchToSection(), RefineErrorLoc(), llvm::FaultMaps::reset(), llvm::TargetLoweringObjectFileCOFF::SelectSectionForGlobal(), and StartsWithGlobalOffsetTable(). Definition at line 320 of file MCSymbol.h. References assert(), Offset, SymbolContents, SymContentsOffset, and SymContentsUnset. Referenced by absoluteSymbolDiff(), declareCommon(), llvm::MCObjectStreamer::EmitRelocDirective(), getLabelOffset(), llvm::RISCVMCExpr::getPCRelHiFixup(), and setCommon(). Get the section associated with a defined, non-absolute symbol. Definition at line 266 of file MCSymbol.h. Referenced by llvm::DwarfCompileUnit::addRange(), llvm::DwarfDebug::addSectionLabel(), llvm::BTFDebug::beginFunctionImpl(), canUseLocalRelocation(), llvm::AsmPrinter::emitDwarfSymbolReference(), llvm::MCELFStreamer::EmitIdent(), llvm::CodeViewContext::encodeInlineLineTable(), GetAEABIUnwindPersonalityName(), getARMFixupKindMachOInfo(), llvm::MCSectionELF::getAssociatedSection(), getFixupKindLog2Size(), getFixupOffset(), llvm::RISCVMCExpr::getPCRelHiFixup(), isAssociative(), llvm::MCObjectWriter::isSymbolRefDifferenceFullyResolvedImpl(), llvm::MachObjectWriter::isSymbolRefDifferenceFullyResolvedImpl(), isWeak(), PrintCFIEscape(), and llvm::MCContext::renameELFSection(). getVariableValue - Get the value for variable symbols. Definition at line 298 of file MCSymbol.h. References assert(), IsUsed, isVariable(), setVariableValue(), and Value. Referenced by canExpand(), llvm::MachObjectWriter::findAliasedSymbol(), getARMFixupKindMachOInfo(), llvm::MCAsmLayout::getBaseSymbol(), getFixupKindLog2Size(), getFixupOffset(), getFragment(), llvm::MachObjectWriter::getSymbolAddress(), getSymbolOffsetImpl(), getSymbolValue(), llvm::MCParserUtils::isSymbolUsedInExpression(), llvm::MCAssembler::isThumbFunc(), isWeak(), matchRegisterNameHelper(), llvm::MCParserUtils::parseAssignmentExpression(), RefineErrorLoc(), and resolveSymbol(). isAbsolute - Check if this is an absolute symbol. Definition at line 261 of file MCSymbol.h. Referenced by isInSection(), isWeak(), and llvm::MachObjectWriter::writeNlist(). Definition at line 282 of file MCSymbol.h. Is this a 'common' symbol. Definition at line 379 of file MCSymbol.h. Referenced by declareCommon(), llvm::MCAsmLayout::getBaseSymbol(), getCommonAlignment(), getCommonSize(), llvm::MCSymbolMachO::getEncodedFlags(), getSymbolValue(), isWeak(), and llvm::MachObjectWriter::writeNlist(). isDefined - Check if this symbol is defined (i.e., it has an address). Defined symbols are either absolute or in some section. Definition at line 247 of file MCSymbol.h. Referenced by emitEncodingByte(), llvm::AsmPrinter::EmitFunctionBody(), llvm::AsmPrinter::EmitFunctionEntryLabel(), llvm::AsmPrinter::EmitGlobalVariable(), llvm::MCObjectStreamer::EmitRelocDirective(), GetAEABIUnwindPersonalityName(), llvm::MCAssembler::getAtom(), llvm::MCSymbolELF::getBinding(), llvm::TargetLoweringObjectFileMachO::getIndirectSymViaGOTPCRel(), isInSection(), isInSymtab(), llvm::MCContext::renameELFSection(), resolveSymbol(), llvm::MachineFunction::tidyLandingPads(), llvm::MMIAddrLabelMap::UpdateForDeletedBlock(), and llvm::MachObjectWriter::writeNlist(). Definition at line 280 of file MCSymbol.h. Referenced by llvm::MCSymbolELF::classof(), countMCSymbolRefExpr(), isShiftedUIntAtAnyPosition(), and llvm::ARMAsmBackend::shouldForceRelocation(). Definition at line 392 of file MCSymbol.h. Referenced by canGoAfterDWARF(), getFixupKindLog2Size(), llvm::TargetLoweringObjectFileMachO::getIndirectSymViaGOTPCRel(), getSymbolValue(), isWeak(), llvm::ARMAsmBackend::shouldForceRelocation(), and llvm::MachObjectWriter::writeNlist(). isInSection - Check if this symbol is defined in some section (i.e., it is defined but not absolute). Definition at line 251 of file MCSymbol.h. Referenced by llvm::BTFDebug::beginFunctionImpl(), canExpand(), canUseLocalRelocation(), countMCSymbolRefExpr(), llvm::MCELFStreamer::EmitIdent(), llvm::MCStreamer::endSection(), llvm::MCAssembler::getAtom(), getFixupKindLog2Size(), llvm::RISCVMCExpr::getPCRelHiFixup(), getSection(), llvm::MCSection::hasEnded(), isAssociative(), isShiftedUIntAtAnyPosition(), llvm::MCAssembler::isSymbolLinkerVisible(), llvm::MachObjectWriter::isSymbolRefDifferenceFullyResolvedImpl(), isWeak(), parseSectionFlags(), and llvm::MCContext::renameELFSection(). Definition at line 284 of file MCSymbol.h. Definition at line 395 of file MCSymbol.h. Referenced by canGoAfterDWARF(), and llvm::MachObjectWriter::writeNlist(). Check if this symbol is redefinable. Definition at line 225 of file MCSymbol.h. Definition at line 209 of file MCSymbol.h. isTemporary - Check if this is an assembler temporary symbol. Definition at line 219 of file MCSymbol.h. Referenced by canUseLocalRelocation(), countMCSymbolRefExpr(), llvm::MCELFStreamer::EmitIdent(), encodeBase64StringEntry(), getARMFixupKindMachOInfo(), getFixupKindLog2Size(), getFixupKindNumBytes(), isInSymtab(), isShiftedUIntAtAnyPosition(), llvm::MCAssembler::isSymbolLinkerVisible(), llvm::MachObjectWriter::isSymbolRefDifferenceFullyResolvedImpl(), isWeak(), and llvm::MCGenDwarfLabelEntry::Make(). isUndefined - Check if this symbol undefined (i.e., implicitly defined). Definition at line 256 of file MCSymbol.h. Referenced by llvm::MachObjectWriter::doesSymbolRequireExternRelocation(), llvm::AsmPrinter::EmitConstantPool(), llvm::MCStreamer::EmitLabel(), getARMFixupKindMachOInfo(), llvm::MCAssembler::getAtom(), getFixupKindLog2Size(), getFixupOffset(), llvm::MachObjectWriter::getSymbolAddress(), getSymbolValue(), isDefined(), llvm::MCObjectWriter::isSymbolRefDifferenceFullyResolved(), isWeak(), makeCombineInst(), llvm::MCParserUtils::parseAssignmentExpression(), llvm::MCContext::renameELFSection(), smallData(), and llvm::MachObjectWriter::writeNlist(). Definition at line 318 of file MCSymbol.h. isUsed - Check if this is used. Definition at line 222 of file MCSymbol.h. Definition at line 213 of file MCSymbol.h. Referenced by llvm::MCSymbolELF::getBinding(), isInSymtab(), llvm::MCAssembler::isSymbolLinkerVisible(), and isWeak(). isVariable - Check if this is a variable symbol. Definition at line 293 of file MCSymbol.h. Referenced by absoluteSymbolDiff(), canUseLocalRelocation(), llvm::AsmPrinter::EmitFunctionEntryLabel(), llvm::AsmPrinter::EmitGlobalVariable(), llvm::MCStreamer::EmitLabel(), llvm::MachObjectWriter::findAliasedSymbol(), getARMFixupKindMachOInfo(), llvm::MCAsmLayout::getBaseSymbol(), getFixupKindLog2Size(), getFixupOffset(), getFragment(), llvm::MachObjectWriter::getSymbolAddress(), getSymbolOffsetImpl(), getSymbolValue(), getVariableValue(), llvm::MachObjectWriter::isSymbolRefDifferenceFullyResolvedImpl(), llvm::MCParserUtils::isSymbolUsedInExpression(), llvm::MCAssembler::isThumbFunc(), isWeak(), matchRegisterNameHelper(), llvm::MCParserUtils::parseAssignmentExpression(), RefineErrorLoc(), resolveSymbol(), and setFragment(). Definition at line 286 of file MCSymbol.h. Modify the flags via a mask. Definition at line 415 of file MCSymbol.h. References assert(), Flags, and NumFlagsBits. Referenced by llvm::MCSymbolMachO::clearReferenceType(), llvm::MCSymbolMachO::setAltEntry(), llvm::MCSymbolCOFF::setClass(), llvm::MCSymbolMachO::setCold(), llvm::MCSymbolWasm::setExported(), llvm::MCSymbolCOFF::setIsSafeSEH(), llvm::MCSymbolCOFF::setIsWeakExternal(), llvm::MCSymbolMachO::setNoDeadStrip(), llvm::MCSymbolMachO::setReferenceTypeUndefinedLazy(), llvm::MCSymbolMachO::setSymbolResolver(), llvm::MCSymbolMachO::setThumbFunc(), llvm::MCSymbolMachO::setWeakDefinition(), and llvm::MCSymbolMachO::setWeakReference(). Definition at line 31 of file MCSymbol.cpp. Definition at line 59 of file MCSymbol.cpp. References C, getName(), llvm::MCAsmInfo::isValidUnquotedName(), Name, llvm::report_fatal_error(), and llvm::MCAsmInfo::supportsNameQuoting(). Referenced by ConvertDoubleToBytes(), createPPCMCAsmInfo(), llvm::NVPTXAsmPrinter::doFinalization(), llvm::X86AsmPrinter::EmitFunctionBodyEnd(), EmitGCCInlineAsmStr(), EmitHiLo(), GetAEABIUnwindPersonalityName(), getOpenCLAlignment(), getPlatformName(), llvm::NVPTXAsmPrinter::getVirtualRegisterName(), llvm::operator<<(), llvm::MCExpr::print(), llvm::WebAssemblyAsmPrinter::PrintAsmOperand(), PrintCFIEscape(), printDwarfFileDirective(), printExpr(), llvm::HexagonAsmPrinter::printOperand(), llvm::ARMAsmPrinter::printOperand(), llvm::MipsAsmPrinter::printOperand(), llvm::MCSectionCOFF::PrintSwitchToSection(), setPrivateExtern(), truncateToSize(), and VisitGlobalVariableForEmission(). Prepare this symbol to be redefined. Definition at line 229 of file MCSymbol.h. References IsRedefinable, setUndefined(), SymbolContents, SymContentsUnset, and SymContentsVariable. Referenced by llvm::AsmPrinter::EmitFunctionEntryLabel(), llvm::AsmPrinter::EmitGlobalVariable(), and llvm::MCStreamer::EmitLabel(). Mark this symbol as being 'common'. Definition at line 344 of file MCSymbol.h. References assert(), CommonAlignLog2, CommonSize, getOffset(), llvm::isPowerOf2_32(), llvm::Log2_32(), NumCommonAlignmentBits, Size, SymbolContents, and SymContentsCommon. Definition at line 393 of file MCSymbol.h. Referenced by GetAEABIUnwindPersonalityName(), and getVariantKind(). Set the (implementation defined) symbol flags. Definition at line 409 of file MCSymbol.h. References assert(), Flags, NumFlagsBits, and Value. Referenced by llvm::MCSymbolELF::isSignature(), llvm::MCSymbolELF::setBinding(), llvm::MCSymbolMachO::setDesc(), llvm::MCSymbolELF::setIsSignature(), llvm::MCSymbolELF::setIsWeakrefUsedInReloc(), llvm::MCSymbolELF::setOther(), llvm::MCSymbolELF::setType(), and llvm::MCSymbolELF::setVisibility(). Mark the symbol as defined in the fragment F.
Definition at line 272 of file MCSymbol.h. References assert(), isVariable(), and llvm::PointerIntPair< PointerTy, IntBits, IntType, PtrTraits, Info >::setPointer(). Referenced by llvm::MCStreamer::AssignFragment(), llvm::MCObjectStreamer::EmitLabel(), llvm::MCStreamer::EmitLabel(), llvm::MCContext::getWasmSection(), and llvm::MCContext::renameELFSection(). Set the (implementation defined) index. Definition at line 314 of file MCSymbol.h. Referenced by isAssociative(), and isInSymtab(). Definition at line 210 of file MCSymbol.h. Definition at line 326 of file MCSymbol.h. References assert(), Offset, SymbolContents, SymContentsOffset, SymContentsUnset, and Value. Referenced by llvm::MCObjectStreamer::EmitLabel(), and GetAEABIUnwindPersonalityName(). Definition at line 396 of file MCSymbol.h. References dump(), IsPrivateExtern, print(), and Value. Mark this symbol as redefinable. Definition at line 227 of file MCSymbol.h. Mark the symbol as undefined. Definition at line 278 of file MCSymbol.h. References llvm::PointerIntPair< PointerTy, IntBits, IntType, PtrTraits, Info >::setPointer(). Referenced by redefineIfPossible(), and setVariableValue(). Definition at line 212 of file MCSymbol.h. Referenced by canUseLocalRelocation(), llvm::MCELFStreamer::EmitIdent(), getFixupKindLog2Size(), and isWeak(). Definition at line 48 of file MCSymbol.cpp. References assert(), IsUsed, setUndefined(), SymbolContents, SymContentsUnset, SymContentsVariable, and Value. Referenced by llvm::MCStreamer::EmitAssignment(), llvm::MCELFStreamer::EmitWeakReference(), llvm::MCWasmStreamer::EmitWeakReference(), getVariableValue(), and RefineErrorLoc(). Definition at line 141 of file MCSymbol.h. Definition at line 140 of file MCSymbol.h. Definition at line 63 of file MCSymbol.h. Referenced by llvm::MCExpr::findAssociatedFragment(), and isAbsolute(). Definition at line 149 of file MCSymbol.h. Definition at line 118 of file MCSymbol.h. Referenced by getCommonAlignment(), and setCommon(). The size of the symbol, if it is 'common'. Definition at line 133 of file MCSymbol.h. Referenced by declareCommon(), getCommonSize(), and setCommon(). Definition at line 123 of file MCSymbol.h. Referenced by llvm::MCSymbolELF::getBinding(), llvm::MCSymbolMachO::getEncodedFlags(), getFlags(), llvm::MCSymbolELF::getOther(), llvm::MCSymbolELF::getType(), llvm::MCSymbolELF::getVisibility(), modifyFlags(), and setFlags(). If a symbol has a Fragment, the section is implied, so we only need one pointer. The special AbsolutePseudoFragment value is for absolute symbols. If this is a variable symbol, this caches the variable value's fragment. FIXME: We might be able to simplify this by having the asm streamer create dummy fragments. If this is a section, then it gives the symbol is defined in. This is null for undefined symbols. If this is a fragment, then it gives the fragment this symbol's value is relative to, if any. For the 'HasName' integer, this is true if this symbol is named. A named symbol will have a pointer to the name allocated in the bytes immediately prior to the MCSymbol. Definition at line 80 of file MCSymbol.h. Index field, for use by the object file implementation. Definition at line 126 of file MCSymbol.h. This symbol is visible outside this translation unit. Definition at line 96 of file MCSymbol.h. Referenced by isExternal(), and setExternal(). This symbol is private extern. Definition at line 99 of file MCSymbol.h. Referenced by isPrivateExtern(), and setPrivateExtern(). True if this symbol can be redefined. Definition at line 88 of file MCSymbol.h. Referenced by isRedefinable(), redefineIfPossible(), and setRedefinable(). Definition at line 93 of file MCSymbol.h. Referenced by isRegistered(), and setIsRegistered(). IsTemporary - True if this is an assembler temporary label, which typically does not survive in the .o file's symbol table. Definition at line 85 of file MCSymbol.h. IsUsed - True if this symbol has been used. Definition at line 91 of file MCSymbol.h. Referenced by getVariableValue(), isUsed(), and setVariableValue(). True if we have created a relocation that uses this symbol. Definition at line 106 of file MCSymbol.h. Referenced by isUsedInReloc(), and setUsedInReloc(). This is actually a SymbolKind enumerator, but is unsigned to avoid sign extension and achieve better bitpacking with MSVC. Definition at line 103 of file MCSymbol.h. Referenced by isCOFF(), isELF(), isMachO(), and isWasm(). The offset to apply to the fragment address to form this symbol's value. Definition at line 130 of file MCSymbol.h. Referenced by getOffset(), MCSymbol(), and setOffset(). This is actually a Contents enumerator, but is unsigned to avoid sign extension and achieve better bitpacking with MSVC. Definition at line 110 of file MCSymbol.h. Referenced by getOffset(), isCommon(), isUnset(), isVariable(), redefineIfPossible(), setCommon(), setOffset(), and setVariableValue(). If non-null, the value for a variable symbol. Definition at line 136 of file MCSymbol.h. Referenced by getVariableValue(), setExternal(), setFlags(), setIndex(), setIsRegistered(), setOffset(), setPrivateExtern(), setRedefinable(), and setVariableValue().